You've just walked out the door of your most recent job interview with one feeling: failure. You may have been unprepared or were caught off-guard by the questions asked. Your actions and body language may have given off the wrong signals. In any event, the looks on your interviewers' faces indicates that you missed the mark in some fashion. However, just because that happens doesn't mean you should mope around in failure. In many ways, a bad interview serves as a great lesson to help you do better in the long run. It may even present an opportunity to recover and still get the job in the end. Here are some ways to get back on your feet and make the best of your worst day. It goes without saying that if you get emotional about this situation, you're probably not moving forward. Of course it's fine to feel awful about it, but don't let these negative emotions overwhelm you. Start by taking a deep breath and understand that what is done is done. If you feel a little too twisted over by the experience, you should grab a pen and paper and just release your feelings onto it. That can provide some relief, according to careers blog Careerealism. Obviously, a bad interview seems like as good a time as any to self-examine what went wrong with the interview. However, as before, don't focus heavily on the mistakes and the what-ifs. As Forbes says, you should forgive yourself for screwing up. Seeking feedback from other people can help you get a better idea of what went wrong as well, since they aren't as anchored to the emotional impact that the failure gave you. By figuring out the mistakes, you can learn from them. 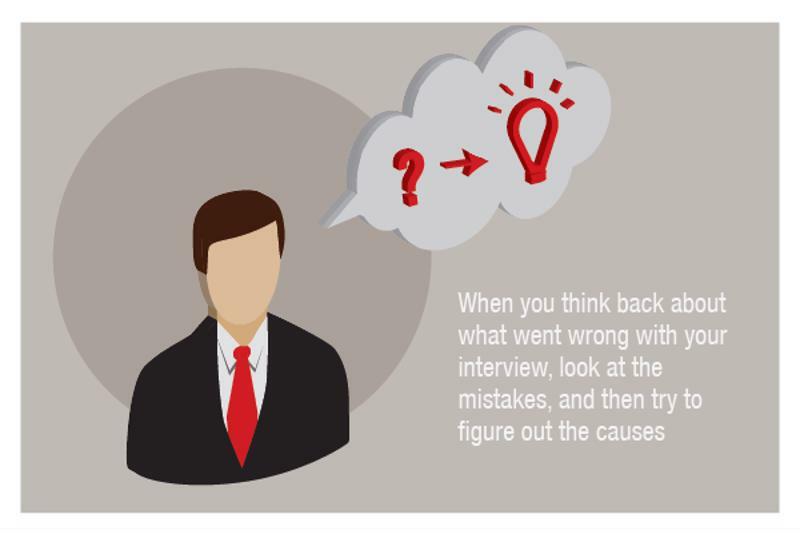 When you think back about what went wrong with your interview, look at the mistakes, and then try to figure out the causes as recommended by Work Coach Cafe. Mistakes don't just suddenly happen. They usually occur for one reason or another. If you flubbed on a question, it may be because you weren't prepared for questions in that particular field. If you were feeling anxious, something may have been distracting you, such as a personal issue. Write these all down, so that you can review and figure out what to do better. Given that the thank-you note is an essential requirement in the post-interview stage, you may find that this standard letter actually presents you an opportunity to salvage your application. It gives you the chance to do some damage control in the form of explaining yourself. Reviewing the mistakes you wrote down, take time to explain them and why they happened the way they did. If you're careful enough to mention only lapses that you're certain the interviewer caught, as well as any issues that may have kept you from performing at your best or other things you think need mentioning, you may find that you'll get a second chance at the job you want. Careful, though, not to turn your note into a last-ditch sales pitch or an attempt to fully recover from a bad interview. Desperation is not a trait demonstrated by top talent.